SunF Corporation has dedicated themselves to meeting their customer's demands and needs. SunF develops and manufactures a wide variety of quality tires in the specialty market. Their line up includes ST trailer, lawn and garden, agriculture, golf cart, ATV Quad Motorcycle, UTV Side by Side, light truck & more! Tires can suit your Arctic Cat, Bombardier, Can-Am, Honda, Kawasaki, Polaris, John Deere, Suzuki off-road vehicle and more. Tires may be used in either front or rear axle. If you have any questions or concerns, please contact us. Tire Size [ 21x7-10 ] designed to mount on 10 (in) RIM. Directional pattern capable of performing not only in loose muddy conditions but also on intermediate terrains. 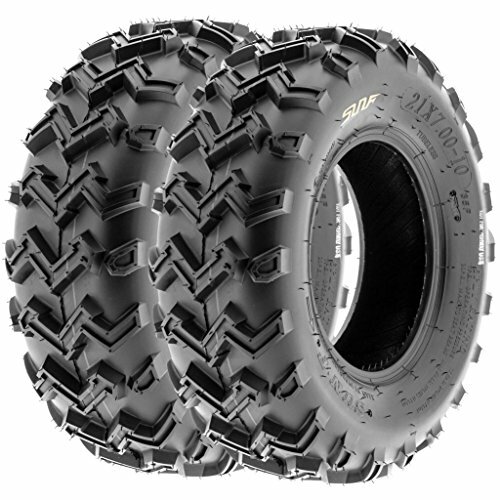 A great all-terrain tubeless bias replacement tire for your quad atv, utility vehicle or golf cart. Aggressive shoulder knobs provide superb side bite and traction. Rim(s) NOT included. Please see full description for specifications. Contact us with any questions or concerns! If you have any questions about this product by SunF, contact us by completing and submitting the form below. If you are looking for a specif part number, please include it with your message.